Memorial Day Weekend 20% off Sale and start of our 13th season! It’s coming on up Memorial Day Weekend, the official start of yard sale season and more importantly, the official start of The Mystery Spot’s Lucky 13 season in Phoenicia and more imporantly than that, our annual Memorial Day Weekend 20% off Yee-Haw Vintage Sale! Ladies and gentlemen, start your engines! 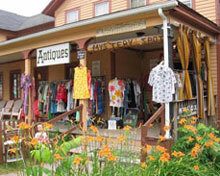 Fill up your tank with unleaded and head straight on up to the very green Catskill Mountains, where you’ll find not only some great tag sales, but Mystery Spot Antiques right smack on Main Street in the glorious little village of Phoenicia, NY. Seven rooms in a former 1800′s hotel packed with antiques, vintage doo-dads, thousands of vinyl records, and tons and tons of vintage clothing. Questions? Have stuff to sell/trade? Coming from a distance? Feel free to call (845-688-7868) or email (info@mysteryspotantiques.com) with any queries whatsoever. Hope to see you this weekend! The Mystery Spot in Phoenicia, NY. Look! Above the jackalopes! It's a bird! It's a plane! Wait...it's a bird! We took a peek inside and found a beautiful blue egg. Meantime, the robin had inadvertently flown into the shop. It flew from room to room – first the record room, then the main room, and finally the room where all our bird paintings hang. We tried and tried to encourage it to fly back out the front door, without success. It would climb onto my finger, but fly away once I moved towards the door. Finally, it flew back outside. She thought it could be…an egg? The robin had laid a perfect blue egg on the bookcase in the bird room. to join the other one already there.